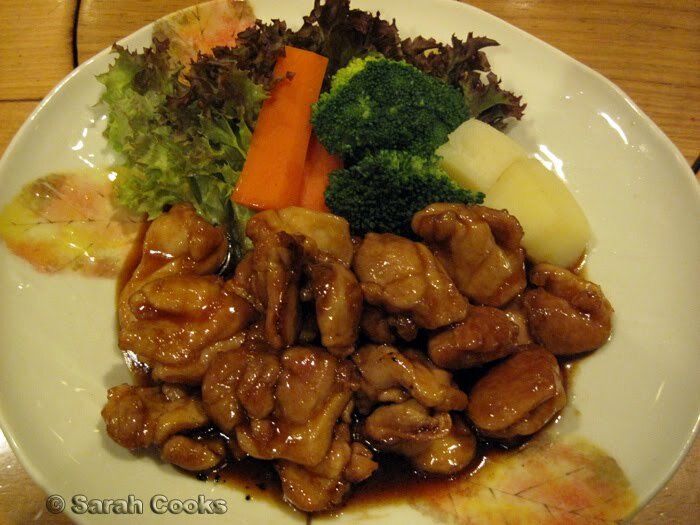 Kenzan is one of my family's favourite restaurants. We used to come here quite often when I was a kid, but now I see the last time we went was four years ago (!!) for my bro's bday. Our long-overdue return was last week on Monday night, for my Dad's birthday. Kenzan is below ground level in Collins place. That's underneath the Sofitel and the Kino, up the Paris end of Collins street. It's only now that I'm older and have been blogging for a while that I really took notice of the decor - Kenzan is simply decorated, with neutral-coloured walls and carpets, a couple of private Japanese-style dining rooms on one side. The first thing that really grabbed our attention was that unlike many fancy restaurants around town, Kenzan is nice and bright! This made it easy to read the menu and see our food. 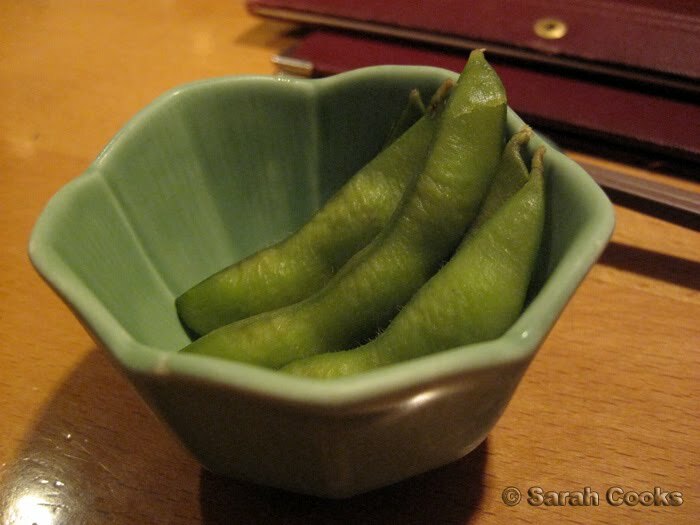 We start with complimentary edamame. ...while I went for a nice warm sake. Lovely and warming on these cold Melbourne nights! 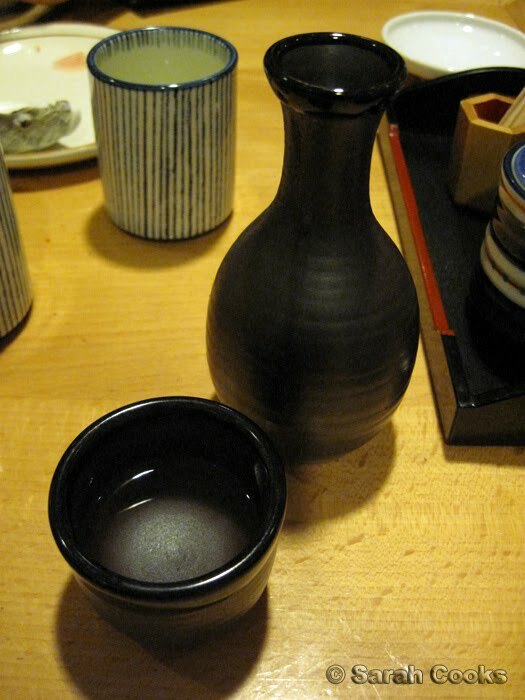 I love the cute sake bottle, and it kept the sake piping hot for a good 2 hours. 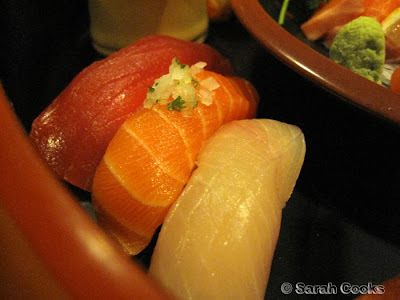 Kenzan's sushi is fabulously fresh and of a consistently high quality. Usually, the large sushi platter is a good quantity for my family, but now that my bro is in Japan, my parents and I found it really filling. The medium size would probably have been better for the 3 of us. 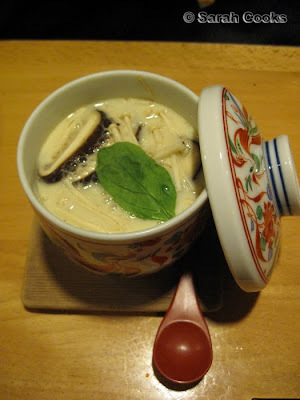 We also ordered a chawan-mushi for Mum. It's her daikoubutsu (favourite Japanese dish)! Sandra doesn't eat seafood, so she had tatsuta-age. 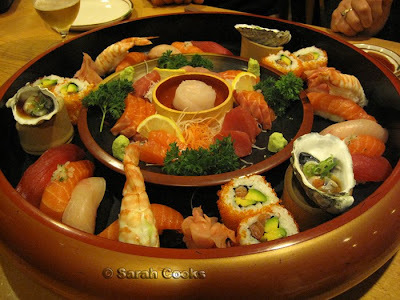 Even though I love sushi, I was suffering serious dish-envy when this came out! Hot, juicy, crispy chicken. Is there anything better? The salad isn't just for garnish, it tastes great too and provides a light, refreshing counterpart against the fried chicken. Japanese salad dressing is so addictive, and everything on that plate got eaten (bar the lemon). Nabeyaki Udon - can't remember the price sorry! 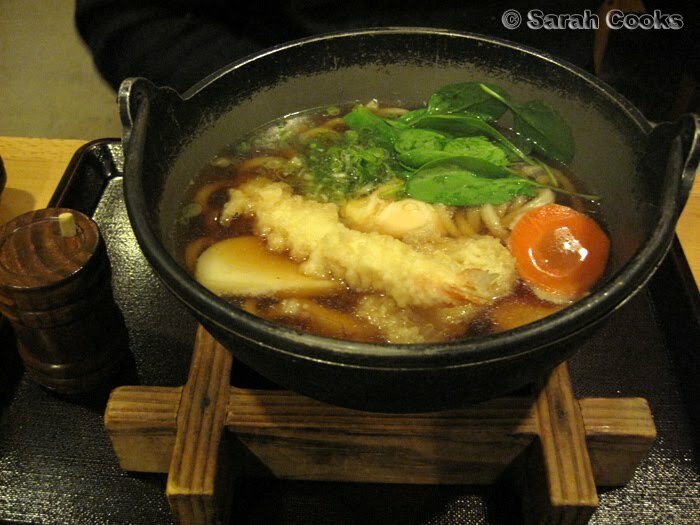 Dad's favourite dish is nabeyaki udon, which is a rich broth, filled with udon, some vegetables and a tempura-ed prawn. 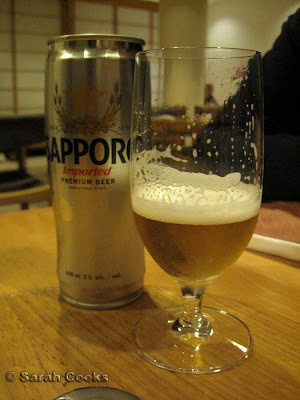 His favourite version was actually at Murasaki on Russell street, but unfortunately, Murasaki has closed now (why Satou-san, why???). I'm glad to report he was most satisfied with Kenzan's version! Sandra did the double-chicken thang, with a teriyaki chicken. It comes with a bowl of rice as well. I love the potato-brocolli-carrot-salad garnish - very Japanese housewife! Mum and I both indulged with a tempura for our mains. Delicious! The pyramid-shaped presentation is very pretty, and in fact it looks vastly better than last time. I'm sure the author of my "beautiful Japanese plating" book would approve! 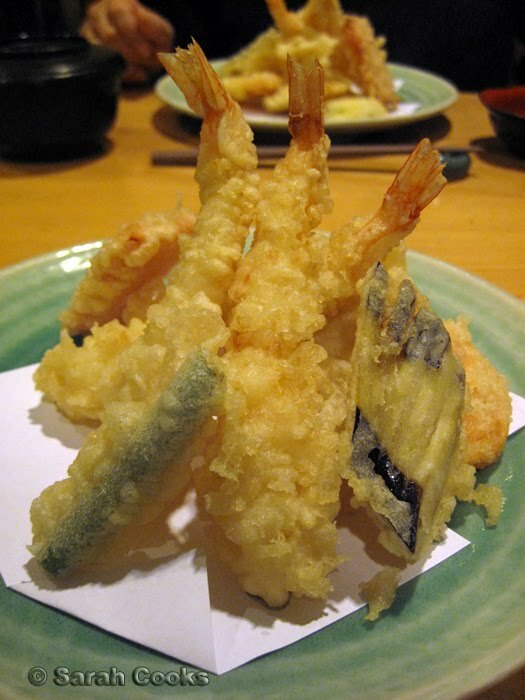 I like the eggplant and the prawns the best, and just like I did when I was a kid, I always save them until last. But can I tell you a secret? I was actually really full by this stage, so I gave the last prawn to my Dad to eat with his nabeyaki. It was his birthday after all! Ordinarily we'd order dessert (matcha ice-cream and anpan, anyone? ), but this year I'd baked my dad a Japanese cheesecake for his birthday, so we had to save room for that. Japanese cheesecake is very different from the dense European-style baked cheesecakes that I am used to, and I'll make sure to blog about it next. I can't believe it's been 4 years since I last visited Kenzan. I must make sure to go more often. At least every 2 years? Hehehe. 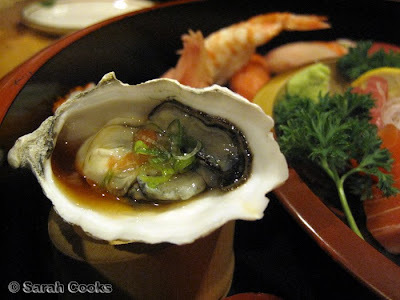 If you haven't been, or heard of it, Kenzan is really a stalwart of the Melbourne food scene, a consistent 1-hatter in the Good Food guide (not that I'm overly concerned with that), and a wonderful place for classic Japanese cuisine. It has been around for over 27 years (yes, it's older than me), and I hope it will be around for many years to come. I've always been interested in this place as I'd heard about it's excellent consistency. Might be worth a visit soon! My experience with Kenzan in January was very disappointing. Sashimi was not as squeaky fresh as it should be and the menu was very uninspiring. 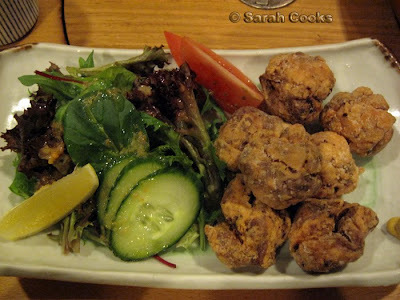 Have you tried Shira Nui in Glen Waverley? I think their fish is fresher and menu more interesting. My visit to Kenzan in January was disappointing. Found the sashimi not squeaky fresh and the menu uninspiring. Have you tried Shira Nui in Glen Waverley? 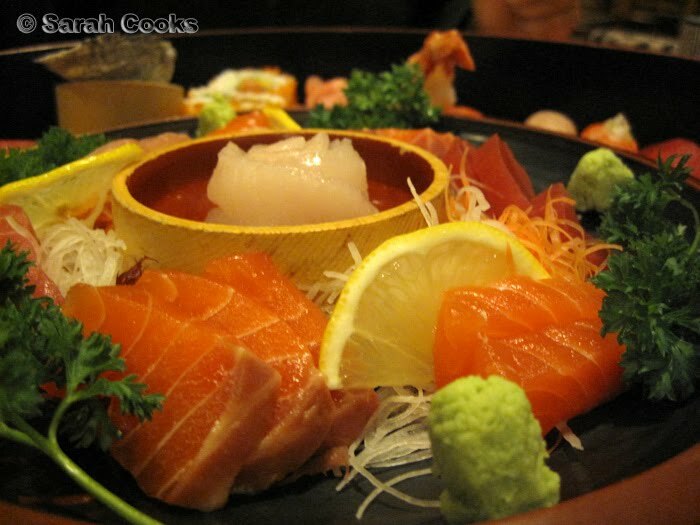 Sushi & sashimi are very good and the omakaze is highly recommended. 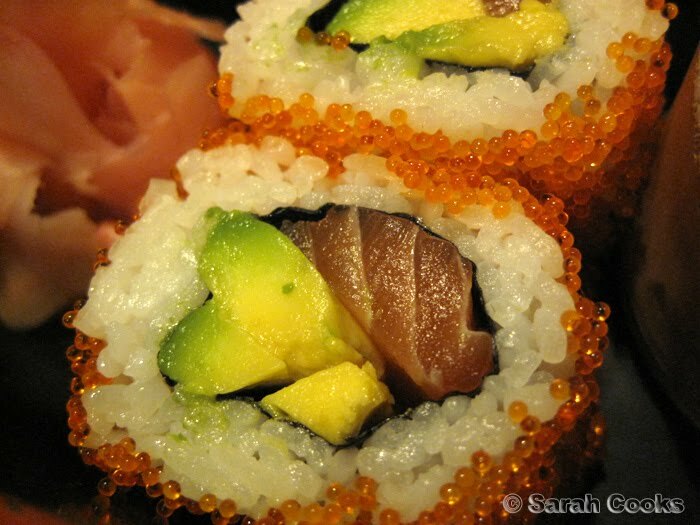 Great review on Kenzan, many thanks Sarah! The photos of the food were mouth-watering.